The Committee requested sight of a number of additional documents. The GSA has contacted the Clerk to provide a comprehensive list of these and we will provide them in due course. Details of our annual return to the Scottish Funding Council in relation to our use of the grant can be requested from the SFC. The GSA Estates Strategy (see http://www.gsa.ac.uk/media/1645127/gsa-document-1-the-glasgow-school-of-art-estates-options-appraisal-draft-the-bond-bryan-partnership-february-2005.pdf) included the Scottish Funding Council funded Phase 1 campus redevelopment project which replaced two no longer fit for purpose buildings (the Newbery Tower and the Foulis Buiding) with the Reid Building, designed by Steven Holl Architects (New York) and JM Architects (Scotland). This issue was covered in the GSA’s Written Submission and supporting documents. In parallel with the Mackintosh Conservation and Access Project, the GSA reviewed our fire safety/prevention procedures for the Mackintosh Building. It is important to restate that the fire prevention and safety measures in the Mackintosh Building at that time were already compliant with what was permissible and suitable in Listed buildings in general and in the Mackintosh Building in particular taking cognizance of its status as a working art school. • Provision of security staff within the building on a 24/7 basis. In 2006, we commissioned a Fire Protection Strategy to review feasible options “for the long term protection of the occupants, property and contents of” the Mackintosh Building. This Fire Protection Strategy led to the Property Protection Feasibility Study. The outcome of this Study was our decision to proceed with the installation of a ‘water mist fire suppression system’ within the Mackintosh Building as an additional measure to protect life, the building and its contents. The mist suppression system which was being installed in 2018 as part of the restoration project was a GSA requirement for when it took repossession of the building and opened its doors once again as a working art school in 2019. For the period of time that the Mackintosh Building was undergoing restoration and was in the possession of the principal contractor, it was covered by Kier Scotland’s fire plan. This plan was required under the terms of the principal contractor contract for the building works. Kier Scotland’s plan included a wide range of measures, but not a sprinkler system as whilst there are some systems that can be used in some building sites, there is no system to our knowledge that could have been used during the works in as complex a building as the Mack. Therefore, Kier Scotland required to put other measures in place to mitigate the risk which they did. 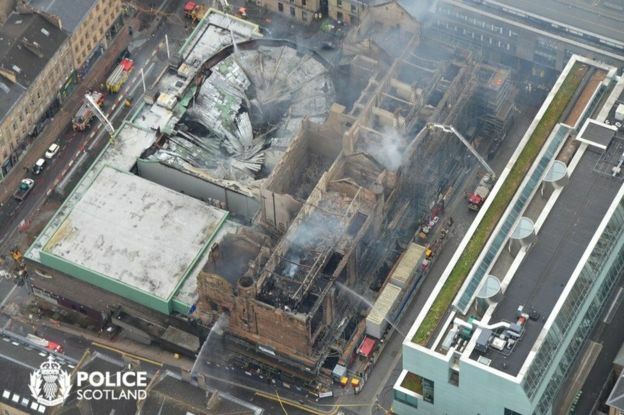 In March 2015, after completion of the archaeological survey of The Library The Glasgow School of Art issued a full media release detailing the impact of the 2014 fire across the GSA’s Archives and Collections. This was covered widely in the media at the time. Meanwhile, the GSA’s Archives and Collections took the following steps to share information about objects lost in the fire. · After the 2014 and 2018 fires, donors were contacted to inform them of any impact to their donations. 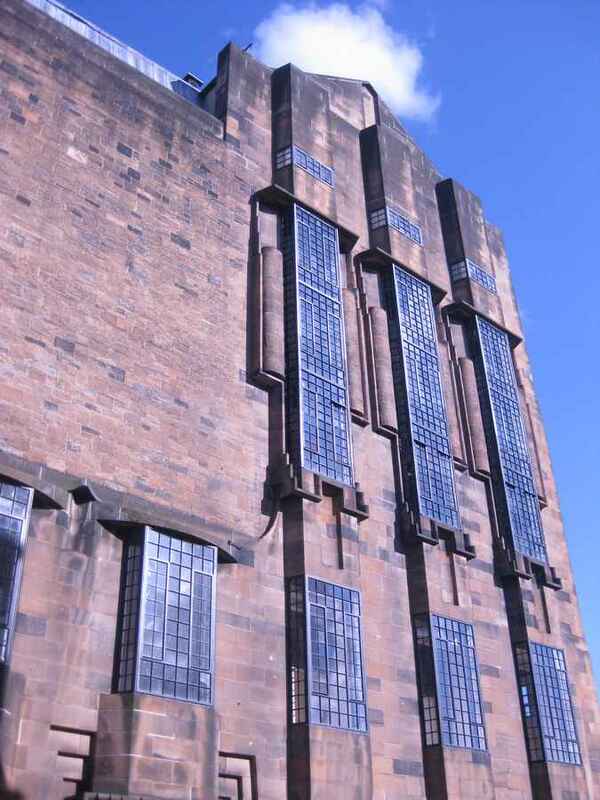 · Museums, Galleries Scotland were provided with details of Mackintosh Collection losses. This was so that they could review if the Mackintosh Collection should retain its Recognised Status. After receiving this statement, MGS confirmed the collection was still of Recognised status. · The A&C free to access online catalogue has an index term ‘23rd May 2014’ which provides an overview of the impact of the fire and also links to images of any collection items lost in the fire. The Scottish Fire and Rescue Service is still undertaking its investigation into the 15 June 2018 fire and until that report is published all commentary on what may or may not have happened is pure speculation. David McGown, Assistant Chief Officer of the Scottish Fire and Rescue Service, has reiterated (The Herald, 15 November 2018) that the their fire investigation experts continue to work alongside their police partners, and through a high volume of information from various sources. He stressed once again that this is a very complex process and will therefore take time.